Have you heard the notion that people eat with their eyes first? It’s true - while the senses of taste, smell, and vision are distinct, visual stimuli have been shown to alter the perception of taste, smell and flavor. For restaurant and food service facilities, this means that not only is cleaning imperative to the health standards of your facility, but also to the overall experience to guests supporting your business. Unger takes what can be complicated cleaning tasks and turns them into easier, safer and greener experiences for your staff and guests. 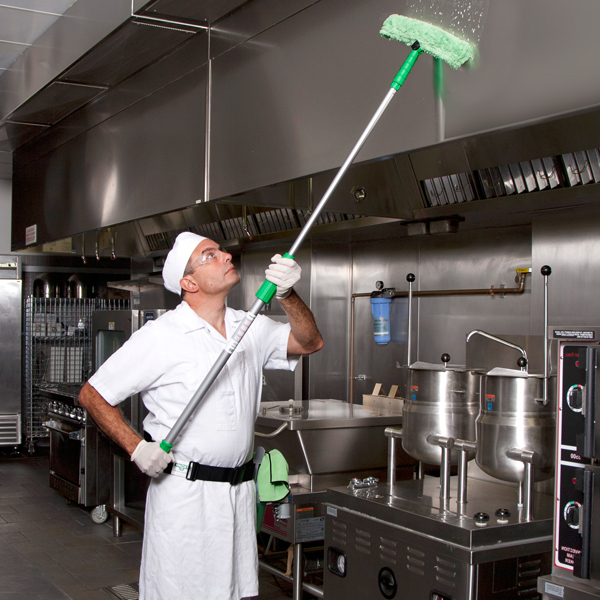 With our innovative commercial cleaning products for the restaurant and food service industry, your staff can better maintain a sanitized work environment and one that’s pleasing to your customers’ senses. With your facility as fresh and clean as the food you serve, you’re well positioned to establish a positive reputation that will help attract and maintain loyal patrons. The fast paced nature of commercial kitchens, combined with the food and beverages being prepared, creates a recipe for ground level safety hazards. When food debris, liquids and grease accumulate on the floor, the conditions are there to increase the risk of slip-and-fall accidents. To minimize the risk of floor related injuries to your staff, Unger offers its cutting edge microfiber string mop system. 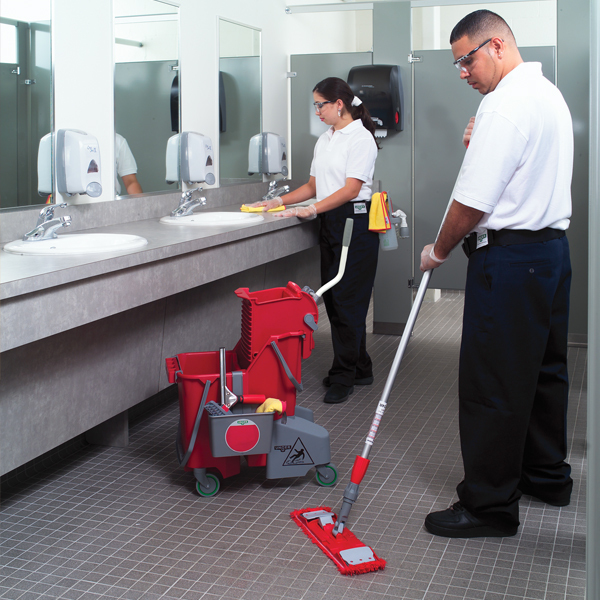 With a wider spread than traditional mop heads, our mops allow workers to clean a larger area, faster. In a fast paced kitchen, quickly addressing debris and spills can make or break the productivity of your kitchen and ultimately, the experience of your guests. Our color coded mops, when combined with our dual bucket floor washing system, leaves kitchen floors cleaner and safer by isolating dirt and maximizing usage of the cleaning solution. By color coding your mops for each cleaning zone in your establishment, you can better prevent cross contamination and implement a highly efficient cleaning process. For maintaining pristine cooking surfaces, Unger’s food service cleaning tools include high heat grill squeegees and double-sided scrapers. Complemented by our extendable poles, kitchen staff can hand clean kitchen hoods and perform high access cleaning to insure the kitchen adheres to the highest cleaning and safety regulations. With a clean cooking foundation in place, you’ve set the stage to produce a cleaner final food product for your patrons and minimize the risk of food contamination. When faced with the larger task of clearing water and food processing waste from loading docks and kitchen work areas, Unger offers the AquaDozer Max, a heavy duty professional floor squeegee. The unique curved blade of the AquaDozer has proven to be twice as efficient at removing waste, allowing your staff to move more in less time, with less effort. Clearing spaces quickly means you keep your operations running smoothly and efficiently without the delays of inaccessible loading docks and the potential safety hazards that can derail productivity efforts. Your front of the house presentation influences your patrons’ first impression of what’s to come. No matter how exquisite your food and service may be, if your dining room and bar areas don’t reflect the same level of quality, then you’re jeopardizing your ability to attract and retain loyal customers. From top to bottom, Unger provides a diverse selection of tools to assist your staff with dusting and high access cleaning so staff can work safely and quickly without the use of lifts and ladders. Unger’s color-coded line of microfiber cloths and ergonomically designed Sprayer on a Belt work to instantly cleanse tabletop surfaces and liquor bottle displays, removing germs, food particles and other contagions that can impact the guest experience and ultimately your reputation. They also require fewer harsh chemicals, lessening the overall environmental impact of cleaning, and the environmental health of staff and guests. For those hard to reach areas, our array of dusters, brushes and pads, combined with our ultra-light weight telescopic poles, allows your staff to easily reach challenging areas. By making ceiling and fixture maintenance easier and safer, your staff can more frequently perform these tasks that go a long way in reflecting a polished presentation to your customers and preventing dust particles from making their way to the table. Within your dining and bar areas, Unger’s Stingray window cleaning kit provides your staff with an efficient way of cleaning even the hardest to reach windows and glass surfaces. Mirrored backdrops, glass and windows abutted by tables are a cinch to access when the Stingray indoor window cleaning solution reaches windows and glass entryways up to 18', without the use of ladders or moving tables. This system enables your staff to get the job done quickly, and it not only cleans: powered by Scotchgard™ Protection, glass becomes easier to clean over time. . As the winner of ISSA’s most innovative cleaning tool, the Stingray also increases efficiency and productivity with a self-contained battery operated cleaning solution dispenser making glass and window cleaning a one-step process. You achieve a streak-free clean on all your window and glass surfaces and your guests get a clear view of your commitment to a pristine environment. First impressions are lasting. To get your guests in and out of your establishment safely and easily, clear, clean parking lots and sidewalks are essential. 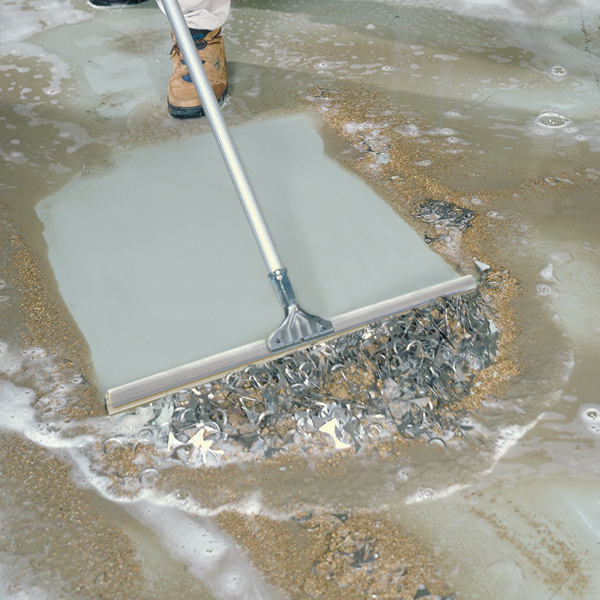 Unger’s AquaDozer industrial floor squeegee makes quick work of moving debris and water. Engineered to move up to twice as much as competing models with its specially designed curved blade, your crew can take care of snow, trash or construction debris with ease. For smaller debris removal jobs, our NiftyNabber Pro trash picker lets your team quickly and safely dispose of any litter on your sidewalks or parking lots. And thanks to the quick work on your part, your guests can safely access your establishment without the hurdles that unkempt sidewalks and parking areas can present. Unger goes beyond the obvious, innovating to bring your hospitality facility the cutting edge in commercial cleaning solutions. 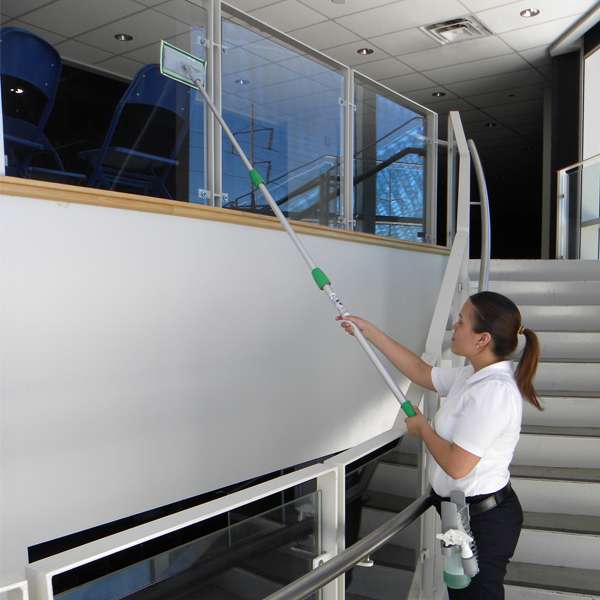 Whether it’s our avid insistence on avoiding contamination with our color-coded systems, or our award-winning window cleaning equipment, Unger brings you a swift, safe and green way of cleaning.